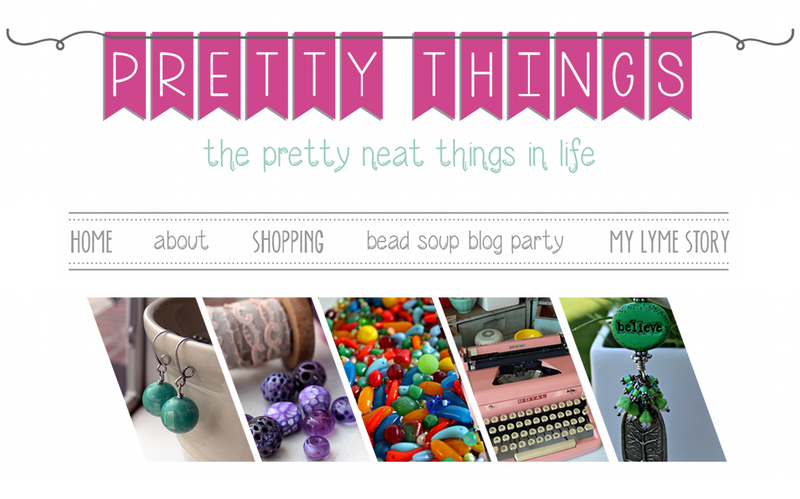 Pretty Things: One Crayon Color Challenge Reveal! Sally Russick of Studio Sublime came up with the clever idea of a One Crayon Color Challenge. Sally is a lovely person I've had the pleasure to meet in person at ArtBliss last year. Her work is also pretty darned amazing. The premise of the challenge is to pick one color and make monochromatic jewelry with the various shades of that color. That's harder than you would think! You would think that beads all of one color would go together easily, but certain shades of that same color can clash like crazy. I chose purple as my color. Love pink, love purple, love blue, but purple it is! I made some lampwork beads, tried by hand at enameling with some glass frit, and pulled out a couple of awesome polymer clay beads by Barbara Bechtel. I thought about several designs but ultimately ended up using the enamel beads. Recently I went to a bead show in Maryland and picked up some interesting dyed coco shell disks. I also raided the AD/Adornments table and found these amazing flat silver flowers and clasp. I added some opal purple Swarovski crystals and here you have it. The bracelet is so lightweight! Love it. I'm just sad I used all of those silver flowers and don't have any more left! I think this is the fastest I've dug into a special stash! I made another piece using a bead I've been hoarding for a long time. Barbara Bechtel made me a bunch of birds in various colors and I saved the purple one. I had NO idea what I'd do with it but knew I had to keep it for myself. I rarely make jewelry for myself, interestingly! I love the stone pendants from River Stone Bead and had hoarded this pendant (what IS it with the hoarding????). I connected the bird with heavy-gauge silver and wrapped that with much thinner wire and oxidized it all. At the bead show, I found the cool faceted silver beads and used those right away. I used Swarovski crystal again (who says you can't use bling with a stone?) and some cool Czech glass ovals. I'm not 100% happy with the purple suede lacing at the back, and I think I'm going to have to order some wider silk ribbon to make it a little more substantial to balance out the pendant. And now for the rest of the challenge participants! Am loving the bracelet! Lovely shade of purple, and I can totally see why you are sad all those flowers are used up! LOVE. ALL. OF. IT. Seriously, it's all gorgeous!!! That bracelet is heavenly...love it! Oh, your designs are so beautiful. The beads you made are fantastic, too! Love the shades of purple. The bracelet is so lovely...the flower beads are so beautiful.I would be holding on to them too! 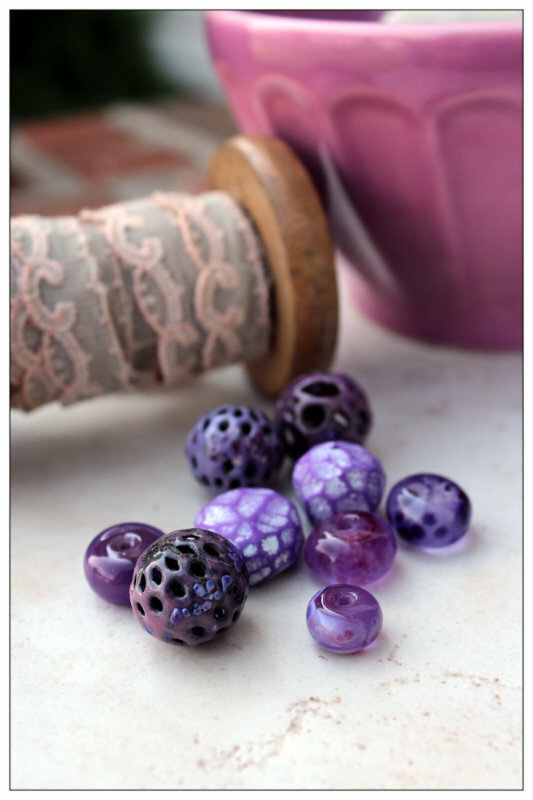 Another one of you artists that can just sit down and make your beads...I have to get started on my learning list!! I love them both. The birds & the bits that look like purple fruit slices are my favorite pieces. You always combine things in ways I wouldn't imagine. Isn't it cool that one little crayon can get us to dig for more inspiration! :) Love that you went through lots of ideas before finally settling on some...I had the same overwhelming purpleness in my life for a couple of weeks. Love the enamel beads. What an awesome job you did. Those little silver beads are the greatest. I can see why you wish you had more. I'm glad to see you are using Swarovski crystal. I have a stash of those but haven't used them much lately. I didn't think that fit in but you have proved me wrong. The necklace is a great piece also but I'm loving the bracelet. Gorgeous!! Both pieces! I love purple. The tones you used are so rich and vibrant!! Fun challenge eh!? Just lovely. I love the purple bird! Ahhhhh, purple! Lovely way to start the day! You go, girl! Great pieces Lori! The bracelet says spring to me! The necklace is lovely, the stone pendant if fabulous - I've never seen one like it! Well who'd have guessed you'd go for purple...Love the bracelet and those awesome silver beads but there's a lovely tranquility and understated elegance about the necklace which is most compelling Miss Lori. Lori, both are beautiful pieces! Gorgeous colors! Wow Lori, you have such a wonderful eye for design. I dont know how you come up with such beautiful ideas time after time...you do it so well it looks flawless, always the perfect balance and bead choices. God given talent with a little practice-makes-perfect on the side! Wow! Wow Lori... these are both gorgeous! I love those silver flowers too. I get the hoarding thing... we have to look at them for awhile that's all. Lori, you have me totally drooling over here! I was so excited when I saw your name on the list of Purple Girls! These two pieces were truly inspired and I can feel it just reading the way you wrote about them. Love your designs and hope you have a magnificent weekend! 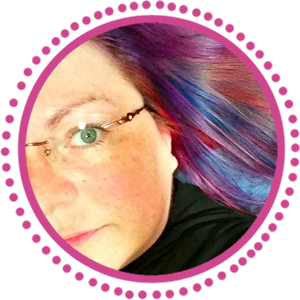 Lori - I started hopping with the purple section because I really wanted to see how purple would look in a monochromatic design. Wow! I really love the flowers in your bracelet, and I can see why you hoarded the bird and the store pendant - they are awesome! I like the purple suede lace. Very pretty designs. Lori, I love both pieces! The purple beads in the bracelet are all gorgeous, and I adore those sweet metal flowers. And the necklace is also beautiful with the various textures and elements. Love the faceted silver beads! Love, love, love these pieces. That bracelet is most amazing! Both pieces are beautiful. I love the shades of purples you used. I wouldn't change the suede. The texture really complements the textures of the other elements, I think, much better than silk would. Yes, I know that hoarding feeling - and I do wear my jewelry all the time (great advertising). It took me a minute to find this little box. Love the bracelet. The little flowers are a great accent. The beads in the necklace are some of my favs. Your photography is perfect. Love the top pic with the beads. Inspiring. I just love love the bracelet! Those little silver flowers with your center accent beads are perfect! I was well worth saving the special beads for the perfect piece! Stunning designs! Love those silver flowers in the bracelet. Everything is beautiful. I love that pendant with the etched birds. So earthy looking. Love that piece. 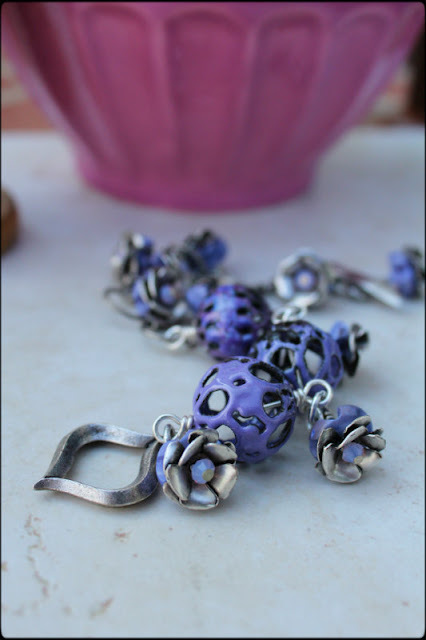 The bracelet is also a beauty with the enameled beads and silver flowers. As for the hoarding? welcome to the club! Lori, oh wow, as always your work amazes. It's so definitively "Lori"! I love the bracelet, but that necklace is my favorite...my style indeed! You did a great job, Lori. I especially fell in love with this wonderful bracelet. The idea to make a different style on each side is great! So you can wear it on one side one day, and change it the next day. Your bracelet is drop dead gorgeous I love it! The necklace is just as beautiful! Love love love the bracelet and those flowers are wonderful! Very nice pieces love the little bird! Mixing textures makes for very interesting and eye catching jewelry. Lori, thank you for your very sweet introduction, it was a pleasure to meet you too! You do some pretty fantastic work too!! I love what you created for the monochromatic hop, BEAUTIFUL!!! 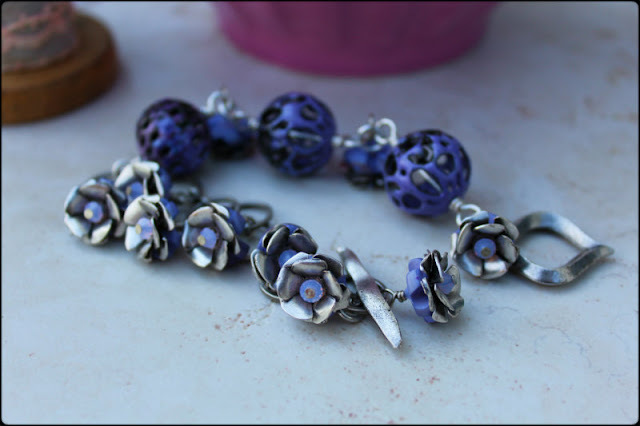 All those wonderful shades of purple with the silver, that bracelet is a real showstopper! The necklace with that gorgeous pendant is so well balanced by that little bird from Barbara! The vivid purple of the the bird is so you!!! Gorgeous, gorgeous work!! 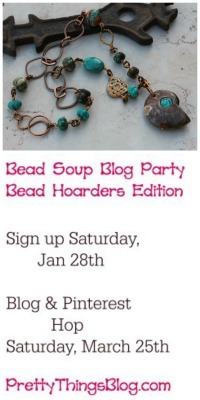 O, I have the bead hoarders disease too!! Thank you so much for join in and participating in the crayon challenge! I hope it you had a lot of fun!! Excellent photography by the way!! Those are just beautiful. I love, love, love that bracelet. Those little flowers are awesome. It is absolutely stunning! Your bracelet is stunning. I don't wear purple much but I love what you did with it. ok, so I didn't realize you MADE beads! those are amazing! and would love to get my hands on those! Oh, I love purple! Those flowers together with the enameled beads are just scrumptious. I know I'd have to keep that one for me! I like the purple suede, but I don't see any ribbon?? They are both wonderful pieces, as usual! I definitely need to have you by my side to purchase beads, you pick the coolest ones!! They're beautiful all of them, but especially love the purple and silver bracelet, it's adorable. you know i love the purples... i caught a glimpse of periwinkle or maybe i was just looking for it! i think the ribbon is a great idea! great job!! i would wear the heck out of these creations! lol. I love both pieces! I love how you put things together. Now, that bracelet is wonderful! The silver flowers rock! Purple deliciousness!!! The flowers are especially yummy -- no wonder you loved them so. And once again, here's to having a nice deep stash of beads to draw from when needed! Great designs! I especially like the bracelet. And those flower dangles are to die for gorgeous. Great bracelet with the enamel beads. Love the way you combined the two shades of purple. Elegant and so wearable. Both beautiful pieces but I'm completely in love with that bracelet, its stunning! Lori, Love what you did with the one color. You are just getting better all the time. I'm always inspired somehow - jewelry or otherwise - when I come to your blog. Thank you. Oh Lori! I love everything. The bracelet with those perfect silver flowers is just gorgeous, totally something I would wear. And your pictures are always so beautiful! I've been obsessed with purple lately, I wonder if we're attracted to certain colors because of how we're feeling. Anywho...LOVE the necklace and bracelet. I'm going to go check out your blog! Looked at your pictures early yesterday. Now I am taking my time looking at everyone in the challenge. You seriously know how to design jewelry that would make me smile and that I would love dearly!! No kidding! 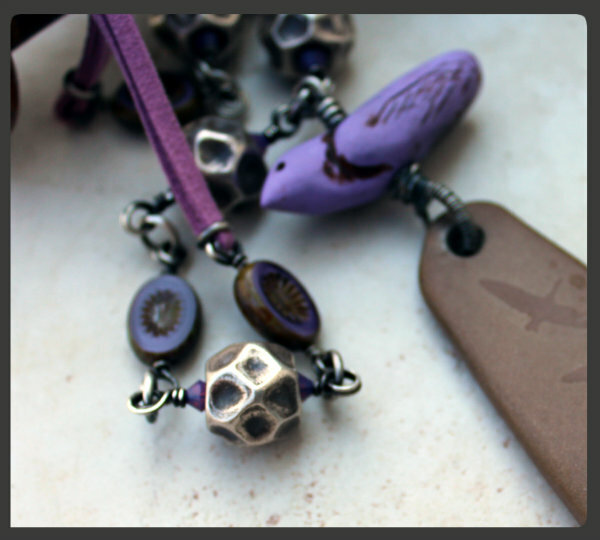 Love the enamel, the bird, the purple, the silver flowers, all of it! Love it! Love the purple bracelet, so feminine and pretty. 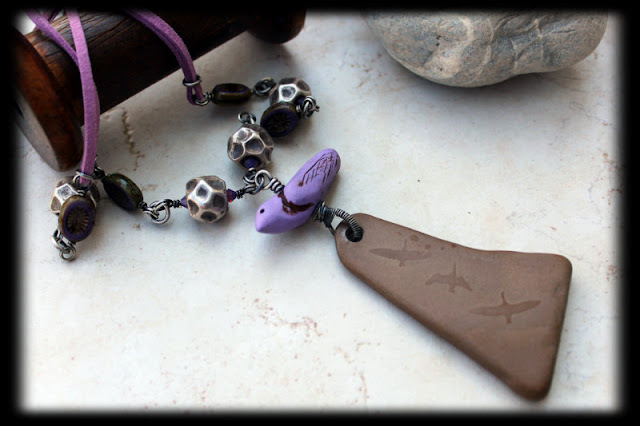 Great pendant for the purple bird, and a lovely necklace. Love them Lori! I love those flowers, too, I hope she has more of them? Gracious! Lori, that bracelet is . . .is . . .is indescribably beautiful! I just love it. And, your necklace is a perfect example of how to mix differing materials. I adore the silver beads with the stone. They seem to work perfectly together. As always, you make me stare in awe at the beauty you've created. Some people say you have to be born with style, but I disagree. I can just click over to Pretty Things and absorb it! Truly gorgeous challenge pieces! 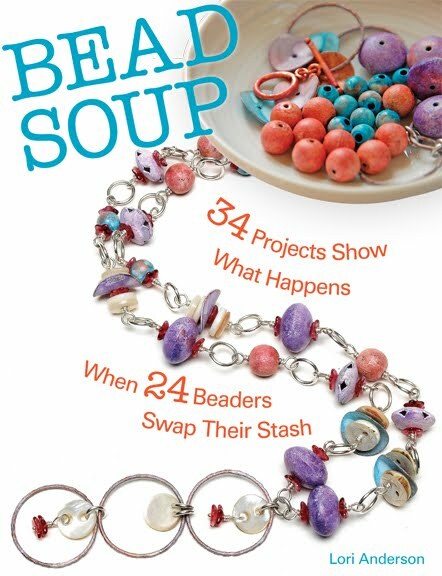 Just picked up a copy of the May Bead trends this morning. Looking forward to savoring your article over lunch! Love what you created Lori! Both pieces are beautiful but that bracelet is nothing but visual happiness -- the color, the texture, those flowers ... everything about it is stunning! I love your bracelet, those silver flowers are great! I love bling! Hi Lori! You have come through with lovely designs once again! The flowers on the bracelet are great! And I am glad you made a piece for yourself! I too, have a hoard. Don't we all? And I live with my precious for a while... Then sometimes I am able to use them in pieces for others, or for sale... Only 1 neck, how many necklaces can I wear at one time? Still chugging along with the color hopping :-)... and seeing so many gorgeous things! ADORE. That bracelet is stunning, Lori~ love the offset design and combination of textures.